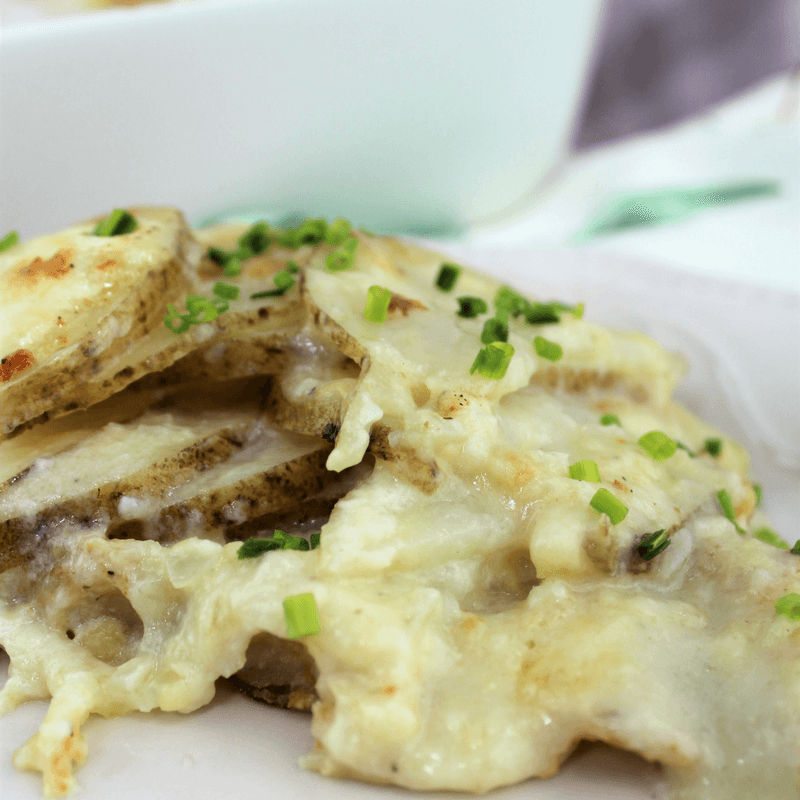 Home Style Scalloped Potatoes with sliced russet potatoes and a creamy cheese sauce. Great for a side dish for a variety of meals. 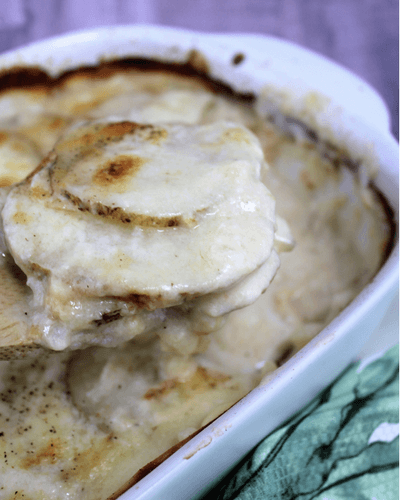 These Home Style Scalloped Potatoes are an old fashioned recipe that is very simple and the cheese can be swapped out for any type you would like. I made them with a mixed Italian cheese today but frequently use a cheddar. Use whatever cheese you please! You cannot go wrong. I posted this recipe today in thought of Easter coming up and thinking about what is going to be on our menu. 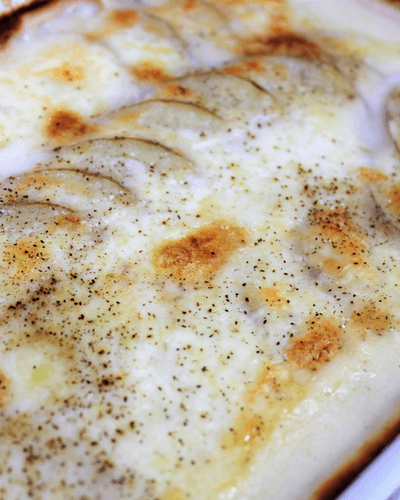 Every Easter, we make a huge ham and multiple side dishes including these scalloped potatoes. Potatoes and ham are just the perfect combination in any form. Get some creamy sauce and potatoes on a fork with a bit of salty ham and oh yes, so heavenly. Comfort food at its finest. We will also make a vegetable side and large salad. Oh, and rolls. Cannot miss the rolls for Easter dinner. Skin on the potatoes? Peel or not to peel? This is up to you. I prefer to keep skins on potatoes as much as possible but some people don’t love the skin so if you are feeding a large group, think about peeling the potatoes to make everyone happy- if that is possible. What type of dishes does your family typically eat for Easter? 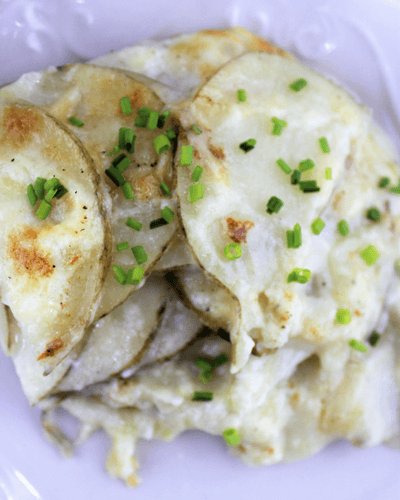 Are scalloped potatoes always on your table? 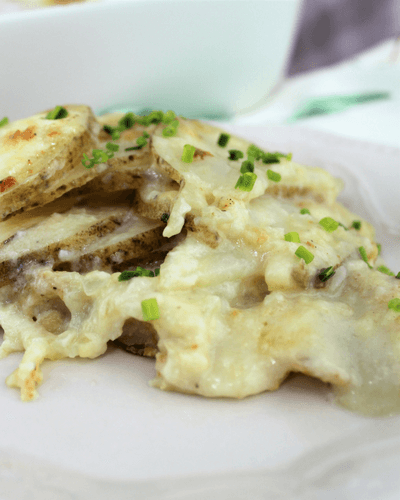 Slice your potatoes as thin as possible and lay half in the bottom of a casserole dish. Chop your onion. Make your sauce. On the stove pan, heat up a sauce pan on medium heat. Add butter and flour. Whisk well and slowly add in the milk. Add your diced onion, minced garlic, salt, pepper and whisk until thickened. Add your cheese, turn off heat and mix until creamy. Pour half your sauce on top of first layer of potatoes in casserole dish. Add the rest of your potatoes and the remainder of your sauce. After 1 hour, remove foil and let bake 30 more minutes uncovered.